We live in challenging times and everyone needs to be able to call on reliable, professional help in managing their financial affairs. At LK, we enjoy working closely with our clients in providing a proactive and value added service and we like to suggest ways to improve and help your business. We offer a competitive fixed fee service which means no surprise bills. This will enable you to discuss ideas with us without worrying about receiving a large fee. We have highly experienced professional staff who will work with you as part of your team. Unlike many accountants we think it is essential to meet with you at least once a year to discuss your business and accounts, so that we understand the issues you may have and suggest solutions for you. Most of our clients have come to us through the personal recommendation of existing clients. Our offices are based on the outskirts of Exeter with easy access and plenty of parking. Call us now to make an initial FREE appointment to discuss how we can help you manage your business. If you are just starting your own business, we can help you with your business plan, financial forecasts and accounting requirements. 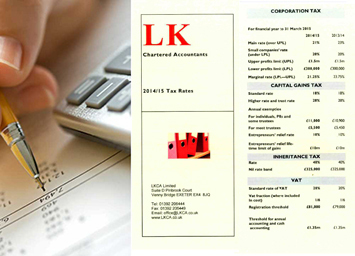 LK Chartered Accountants can help you to put all your business finances in order while you are concentrating on the growth of your business. We can help you with and advise you on all aspects of taxation including PAYE, VAT, income tax, corporation tax, capital gains tax and inheritance tax.